Which therapy technique works best? 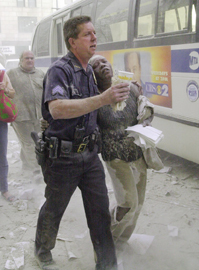 The terrorist attack on the World Trade Center sent thousands of terrified people running for their lives. Many of those survivors — and perhaps tens of thousands of other New Yorkers — are now showing classic symptoms of the anxiety disorders that typically develop after a horrifying event. America's largest mental health emergency has turned the spotlight on the debate over which treatments are most effective for treating post-traumatic stress disorder (PTSD). Research indicates the most effective treatment is cognitive-behavioral therapy (CBT), but it doesn't work for all patients, and most therapists are more familiar with “talk therapy.” Experts hope the largest-scale effort to treat PTSD ever attempted — now taking place in New York — will help determine which is the most beneficial treatment.